There's no denying it. Spiders are a mischievous breed. Their speed and dexterity allow them to sneak into your precious home, especially in the cold-weather months when they're looking for a warm place to hide. They find their way inside through cracks in the foundation or under doors, or they hitch a ride on your pets, clothes or other belongings. Spiders are an unsightly, potentially venomous pest and, for many, an unwelcome house guest. When it comes to getting rid of them, consider physical, chemical and all-natural methods. Spiders love the outdoors. But, as soon as the temperature drops, they make their way towards any source of heat. Typically, that source is your home. Any cracks or broken seals in your house will let them in, so closing those gaps is critical to pest reduction. Use a fine mesh screen to cover any vents or chimney openings, replace damaged window screens and use caulk sealant to seal any cracks in your foundation. To seal up a crack under a door, line the bottom with foam weather stripping and install a door sweep. Keep in mind that spiders can make their way through a gap as small as the width of a dime. Caulk sealant can be used thoroughly around your house. Use it to fill cracks around windows, plumbing and electrical units. Sometimes the only way to get rid of a spider infestation is through chemical pesticides. Spray repellents around cracks both inside and outside the home. Think about how an insect could enter. Common places of entry include around windows, doors and plumbing. If spraying indoors, consider any health concerns. Some chemicals, like benzene and acephate, can be fatal to children and pets, so avoid them at all costs. Your best bet is to use botanical insecticides derived from plants. 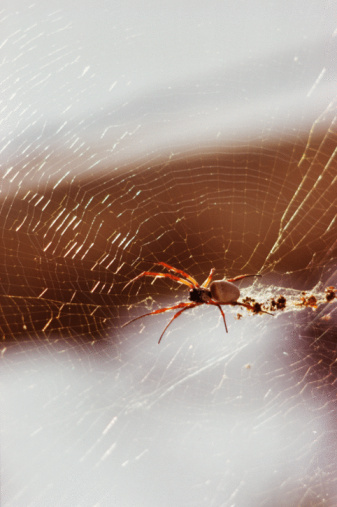 Ridding your home of spiders naturally is a healthy, eco-friendly option. Plus, you can find most ingredients for natural insect repellent in your own pantry. Peppermint oil works great to repel spiders naturally. The insects despise the scent and avoid any area where its present. Use a dropper and dab peppermint oil in any cracks and crevices in and around the home, like near window sills and door frames. Another great natural repellent is white vinegar. Along with its other thousands of household uses, vinegar can be used to kill and deter spiders. The liquid contains acetic acid, which can be fatal to spiders upon direct contact. Mix a solution of equal parts water and vinegar, then spray this on any cobwebs or areas where spiders may gather. Make sure you physically brush off, too, before you head indoors to minimize any unwanted guests from hitching a ride inside. The most common poisonous spiders in the U.S. are the brown recluse, which has a dark-brown body a 1/4 inch long, and the slightly larger black widow, a shiny black spider with a red spot on its underbelly. Look out for these pests as their bite can be fatal. Call an exterminator if you spot them outside in your garden or inside your home.